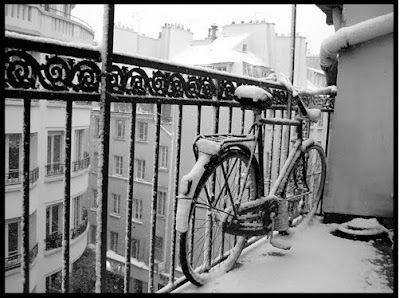 A Moveable Beast: Winter in Paris: Pleasure or Pain? Winter in Paris: Pleasure or Pain? I'm beginning to understand that I'm a bit of a masochist. I'm bored by things / people / places that make life too easy, which is probably why I like ornery cats, most fictional villains, winter and (if I'm being honest) the French. To clarify, I have nothing against Golden Retrievers, damsels in distress, summer or ... who's fun and non-controversial?... the Swedish. It's just that I also like a challenge. I like to be initially offended but ultimately won over. I like things that don't care if I like them or not. And thus, I love winter in Paris. It provides a dark, dismal, unapologetic, multi-month challenge that pushes you to your breaking point, but offers various olive branches along the way—pretty hanging lights, vin chaud, chocolat a l'ancienne, and a great excuse to drink serious red wines and then crawl into bed. Because making pleasure out of pain is the best way to beat winter at its own game... especially in Paris.
" I like things that don't care if I like them or not." that sums up perfectly how i feel about most things. well said. a fabulous take on one of the most mis-understood seasons. I'm exactly the same way!! At least Paris has it's charm. Berlin is less charming this time of year but I still like the challenge of trying to embrace it. Sounds divine! I crave "snow days" when it's perfectly acceptable to hole up in a cozy abode with yummy comfort food and a bottle of bourbon, watch old movies and never get out your pj's. Even better if you can do this for an entire weekend. Thanks so much for linking to my post! Paris in Winter is not to be missed :) Perfect cafe and museum weather and don't forget the sales, Christmas markets and all the Christmas lights around the city and at the department stores. And just like your photo in the post - Paris is very photogenic with a little dusting of snow. Le sigh. So, it's all pleasure in my book! Paris is always charming compared to most other places. Love the pic of the bicycle. If I had the choice there is no doubt where I'd live, snow or not!